For anyone, choosing what to do with your life is a stressful guessing game. With hard work and some luck comes no shortage of great opportunities. And, with opportunity, many tough choices. By way of example, let’s take a standard tough decision: what to do after graduating college. Let’s say you have two job offers, Job A and Job B. Job A is for a position at a large firm where you’ll be doing work that doesn’t interest you, but will pay 30% more than Job B. The second job is at a smaller company where you’ll be paid less, but it will expose you to greater learning opportunities and responsibility. What do you choose? This answer will depend on the mental models you use to weigh different factors. Whether you realize it or not, your mental models determine how you think about the world. One set of people will be optimizing for money over just about anything else – maybe they want to save up for a special purchase, or have a lot of debt to pay off. Others will focus on learning and hope that it pays off in the future. These types of “which job” questions are relatively straightforward. The really tough questions come when choosing your work. You only have one life, and where you choose to focus your energy will determine a lot about your future – your happiness, well-being and long-term impact on the world. The most useful framework I’ve found for making such decisions was introduced to me 2 years ago by the brilliant Nick Pinkston. Essentially, if you’re aiming for impact as opposed to personal happiness, your approach will be far different than someone who’s optimizing for personal freedom. Let’s take doctors as an example. Doctors clearly have a large impact in that they help people achieve a much higher quality of life than they would otherwise. They help the sick recover and generally keep people healthy. They do a lot of good. However, as an individual focusing on making an impact, becoming a doctor probably isn’t the best path. Though relatively high on the impact scale, doctors are also highly replaceable. There are hundreds of thousands of them in the US, and 25,000 new doctors enter the market every year. If you choose not to become a doctor, someone will easily fill your stethoscope. A similar dynamic exists among teachers. Hundreds of thousands of new teachers flood the market each year, leading to a glut of teachers. Though replaceable, they clearly have a tremendous impact on their students. Thus their position in the bottom right of the above matrix. Contrast this with someone like a cancer researcher or entrepreneur like Elon Musk. Each of these people, if they succeed, will have an enormous impact on humanity. Additionally, few people are cut out for highly technical research or starting futuristic companies – each of these individuals is extremely difficult to replace. Without Elon Musk, we don’t have Tesla, SpaceX and the Hyperloop. We have a void. On the other side are those who are difficult to replace (athletes, actors and the like) but who have a relatively low impact on humanity. Though famous and hard to replace, the existence of someone like Cameron Diaz doesn’t add to human progress. Then, you have those who’s work is both low-impact and easily replaceable. No matter what your values, you probably don’t want to be in this quadrant. Now, I want to be clear – doing things that are not high impact and hard to replace is not wrong. 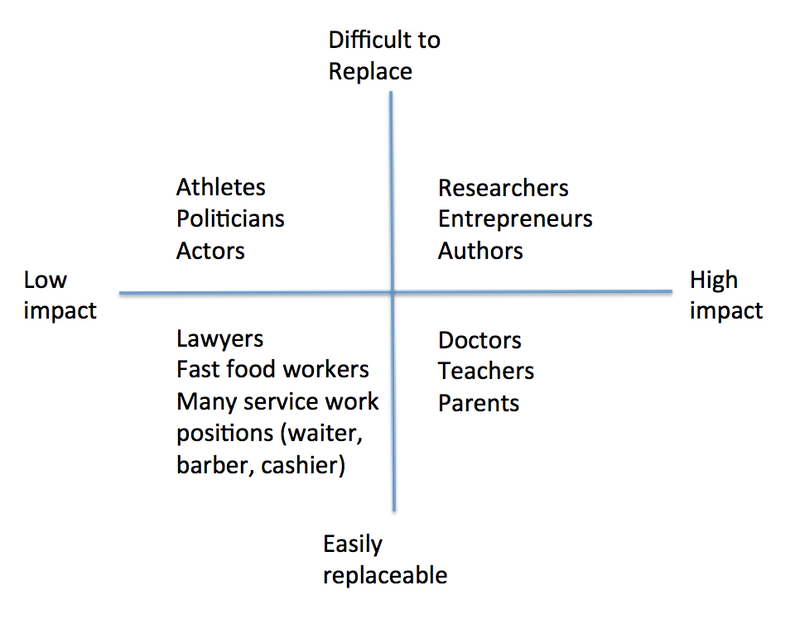 Those who work in low-impact and highly replaceable jobs are not doing anything wrong – every option in the matrix is totally valid for individuals with different goals. This is just a framework I’ve found useful in giving me clarity around some major life decisions. Choosing a career path based on the above framework can lead to a lot of misunderstandings. In college, I dated a girl who’s mental models and values were traditional – “do well in school and then get the best job you can.” Mine was a little different: I was optimizing more for learning and being around smart people as much as possible. This led to quite a few arguments: I saw skipping some class to take a meeting with someone as the correct decision. I was getting to know smart people and learning faster! She saw the opposite: to her, I was hurting my chances of getting a good job after college and jeopardizing a good career in finance (my college major). Thinking through your mental models can be extremely useful as you think about careers and what you want to do with your life. In the end, it’s a highly personal thing – deciding what you care about and how best to get there is a process that only you can begin. This reflection also allows you to contextualize the many things you’ll read about life choices. It changes how you react to someone espousing how they’ve quit their job to travel the world. Instead of feeling like you’re missing out, you can pause, reflect and realize that they’re operating under a different set of values. They’re optimizing for something else (variety of experiences?) than you are, and consequently have a very different path to achieve their goals. Love this, though I think a huge challenge in itself is understanding which box we really want and having the courage to admit it. I’d be hard pressed to find someone who says they don’t want to be “high impact,” yet many of those people would cringe at the idea of working incredibly hard for majority of their existence if the sole payoff was impact vs. freedom, financial means, status etc. The biggest contention for me is impact vs. freedom. I want both, but they seem more at odds than a lot of things other people chase. Thanks homie. You’re completely right, it’s really difficult to figure out where you stand and then be OK with going after it. It’s also hard to stop measuring yourself against those who may be running after different values.